This brownish - red oil lamp is made from terra cotta and includes hand made designs that are similar to the style found in actual ancient types of hand held olive oil lamps. This is an interesting item that is also quite attractive, and a pleasure to have in your own home or offer as a special gift. 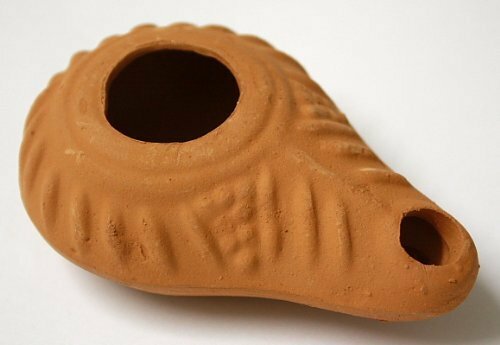 This terra cotta replica of an ancient olive oil lamp is made in the same style as actual clay lamps used in ancient Judea or Israel. This lamp resembles the original lamps from Biblical times and can be used as were the ancient lamps, with olive oil and a fiber wick. "A mitzvah is a lamp," says King Solomon in Proverbs, "and Torah, light." Light is commonly used as a metaphor in the Torah and assumes three different forms: light as a tool used in life, light as a means of connecting to a higher place, and light as light. If you have any questions about this product by Body-Soul-n-Spirit Judaica Galleria, contact us by completing and submitting the form below. If you are looking for a specif part number, please include it with your message.